Himalayan Salt | Become Healthy or Extinct! Himalayan salt is rock salt or halite from a mine in the Punjab Region of Pakistan, which rises from the Indo-Gangetic Plain. It is mined in the Khewra Salt Mine, located in Khewra, Jhelum District, Punjab Region, Pakistan. The salt sometimes occurs in a reddish or pink color, with some crystals having an off-white to transparent color. In 2003 the Bavarian consumer protection agency Bayerisches Landesamt für Gesundheit und Lebensmittelsicherheit (the Bavarian State Office for Health and Food Safety) analyzed 15 specimens of Himalaya salt sold in Germany and could detect at least ten different minerals, in addition to sodium chloride (98%). The chemical composition of Himalayan salt includes 95–96% sodium chloride, contaminated with 2–3% polyhalite and small amounts of ten other minerals. The pink color is due to iron oxide. 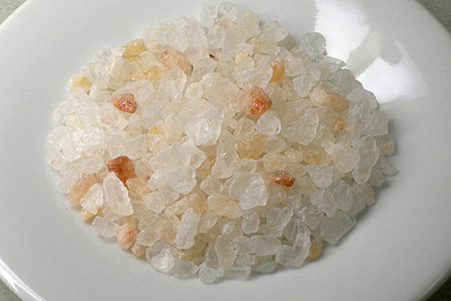 It is commonly used in cooking, in place of other table salt, in brine, and for bath products such as bath salts. Blocks of salt are also used as serving dishes and in the preparation of food. Fish and some meats can be preserved for use in certain dishes, and blocks of salt can be slowly heated to a temperature of around 400 degrees Fahrenheit and used as a cooking surface thereafter. The Himalayan salt provides beneficial all natural, free-harsh chemical remedies for different body condition. Its brine solution is the fluid state of the sun or light energy. In this combination, balance is being achieved since the positive ions of the water surround the negative ions of the water and the negative ions surround the positive ions of the water. This causes the molecules to be hydrolyzed. This brine solution creates a 24-hour profound vibration to the body. The solution will bring back this energy pattern in our body that is decreasing when one is sick. The brine solution provides a detoxifying effect on the body. For the skin, it helps minerals to be penetrated easily. The solution also cures other skin irritations. It can also be used for other post-operative care, rheumatism, joint ailments and insect bites or wounds. It can also be used as sole bath. This will reactivate the body’s ability for self-healing and body’s electric current. Ear Infections. Using sole as eardrops will help in curing ear infections. Acne. To lessen the acne, use a brine facial wash. To use Himalayan salt as face or body scrub, just mix the salt with a fragrance free, organic soap. Foot Fungus. Soak your feet with the brine solution and see the difference. 5. Psoriasis. Take brine solution to the affected skin area and rub. Then allow the brine to dry. Motion Sickness. To get the energetic balancing properties of the salt, make a pouch of salt and wear it around your neck. Sore Throats. Gargle with warm sole solution. Don’t swallow the solution. This will ease your sore throat. Balance Body PH factor. The sole helps in maintaining a balanced ph factor for the body. It can help in eliminating heavy metals in the body. Some of these metals are lead, arsenic, mercury and calcium. The salt has the ability to dissolve their molecular structures. Menstrual complaints. If you are experiencing menstrual cramps, use a warm salt sachet for 30minutes. You can also get a cloth and dip it on the sole. Wring and put the cloth on your abdomen. Then cover it with towel and put a hot water bottle. Allow this for 30 minutes to get rid of the cramps. Headaches. Use concentrated sole solution to massage the head and neck. For severe headaches, you can also apply a cold compress by combining1 teaspoon of sole to 1 tablespoons of cold water. Change as necessary. Chronic Respiratory Illness. Asthma, sinusitis and bronchitis can be treated with brine inhalation therapy. Head a pot and add a minimum of 0.7 of salt with the boiling water. Cover your head with a towel and breathe in the brine steam. Do this for 10 to 15 minutes. The pollutants will be coughed out in about 30 minutes from inhaling the brine solution.